Trim asparagus, rinse and cook in boiling salt water until just cooked. Use 1-2 ham slices to wrap 5-6 spears and put on baking sheet. Bake for about 10 minutes. While ham and asparagus are baking, mix Mac Yourself™ cheddar cheese powder, milk and butter. Heat to 180° and hold temp for 5 minutes. 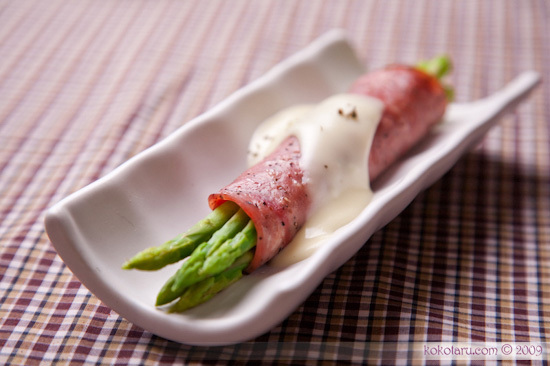 When asparagus is done remove from oven and place on plates. Pour cheese sauce over roll ups.